LITTLE ROCK, Ark. — Two Trojans received Sun Belt Player of the Week honors for their outstanding performances in Little Rock's 3-0 week, including two wins over No. 24 Coastal Carolina. Riley Pittman received Player of the Week honors while Hayden Arnold garnered Pitcher of the Week honors. Both players are receiving the honor for the first time in their careers. Pittman had an incredible week at the plate, going 8-for-10 (.800) with a four-double performance against UAPB, tying the school record for doubles in a game. The senior scored seven runs, notched five RBI and blasted a crucial home run in the team's game one victory over the Chanticleers. In game two, Pittman went 3-for-4, driving in four runs. Pittman is leading the Trojans with a .345 average, 10 doubles and 32 RBI on the season, while racking up six home runs on the year. Arnold was masterful in his start against Coastal Carolina, tossing seven scoreless innings while only allowing three hits and punching out seven Chanticleers. After allowing a hit to the first hitter of the game, Arnold retired 17 straight batters. The sophomore threw 113 pitches to earn the 14-0 win over Coastal Carolina. Arnold now leads the team with a 3.35 ERA, .234 opponent batting average and a perfect 3-0 record. 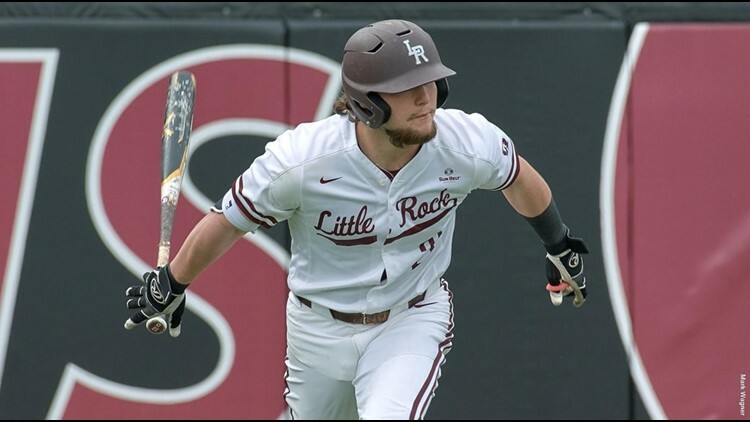 Little Rock gets back to action tonight at Gary Hogan Field when they take on in-state rival Central Arkansas, first pitch scheduled for 6 p.m.